Acura goes from the conservative luxury of the Integra and Tsx to the downright futuristic with the NSX. Honda started to redefine itself as a high end manufacturer with the Acura line in 1986, and since then it’s reinvented itself again and again, with a boom in sales in the early 2000’s, and a steady legacy of high performance since then. Today, Acura is synonymous with quality, and the Acura has earned its place beside Lexus, BMW, and Mercedes as a top shelf luxury vehicle. Acura owners love their cars, and like most car lovers, they love to keep their cars in like new condition. Menke’s understands luxury vehicles, and we’re prepared to preserve your Acura in the warm glow of display room perfection. The Acura has such a universal appeal that it’s easy to forget that it’s a Japanese vehicle, and like all Japanese vehicles, it takes special equipment and technology to properly service. Luckily, Menke’s is fully equipped with what it takes to keep your Acura in factory new condition. We utilize cutting edge technology and manufacturer specific parts to keep your resale value as high as possible, and your car running as beautifully as the day it was born. From computer engine analysis to full reprogramming systems, there’s no problem that a Japanese car can acquire that Menke’s can’t fix. Menke’s is well known as a luxury vehicle garage, and we’re prepared to give your car the luxury treatment. It starts with a staff of technicians who are updated on the newest makes and models of Japanese vehicles on a quarterly basis. Our team is fully ASE certified to service the Acura, and it’s no surprise that we’ve been consistently honored as Evansville area’s best repair staff. From our Best Dressed Shop award to a 2014 Facility of the Year award to our acknowledgement as the only AAA Approved automotive repair shop in the area, you can rest assured that your vehicle is in very good hands. Technology, training, and attention to detail mean that your car gets the tender loving care that it deserves on the inside, but you might not even realize how good our technicians are until you notice how long your car has been running without an issue. What you will notice is free loaner cars, the cleanest shop you’ve ever laid eyes on, friendly and attentive customer service, and the most comfortable living room like waiting area you’ve ever experienced. With free wifi, cable television, and comfy couches, you might just want to take off your shoes and stay awhile. It takes a total package to be named the best automotive repair shop in the country. 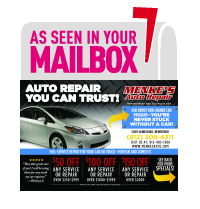 Find out why Menke’s is leading the way in automotive repair.